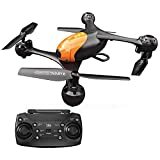 Best Hubsan Drones 2019 – reviews of the top hubsan drones for sale in 2019. Find out which Hubsan Brand drones are best. Featuring H109S X4 Pro, H501S X4, H502E and more. This has been rated the number one drone model of the Hubsan brand. For many experienced drone enthusiasts, the Hubsan H501S model is definitely among the favorite, low-cost X4 quadcopters. Powered by a 2700mAh LiPo battery, this tremendously sleek drone has an exterior that has come a long way in stepping up the drone game, especially when compared to previous Hubsan models. It sells for approximately $200. Its capacity to handle flight durations up to 20 minutes is among the biggest standout features of this drone. Additionally, its flight time is similar to that of more advanced drones like the DJI Phantom and Parrot Bepop. It has a brushless 5.4GHz transmission that enables a seamless FPV experience, powered by its integrated 1080P camera. Within this price range, the H501S X4 is among the most stunning drones you will ever see. Under each arm, there are also 4 bright LED lights. • The drone has a remarkable camera unit that produces breath-taking picture quality. • It has brushless motors that are adequately powerful and durable. • It is designed with a well-defined GPS module. 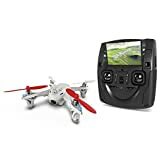 • It has a 4.3-inch transmitter display that makes it easy to view through the drone lenses. • The package includes spare blades and propellers. Locks on up to 12 satellites for excellent position locking and tracking. High performance brushed DC motors providing longer run time and last longer. This drone provides a nice middle-ground between Hubsan’s lower-end and higher-end quadcopters. 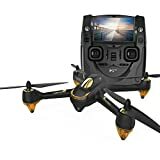 It is equipped with a 720P camera and the lack of FPV does not quite compare to the 1080P resolution and other impressive features on the Hubsan H109S and H501S drones, for example. However, this drone is remarkable for beginners and individuals looking for that additional quad-flying experience. The absence of FPV on the H502E requires a more minimal and simplistic transmitter that remains easy and fun to operate. The 720P camera has the capacity to capture videos and pictures from 100 meters away. Additionally, its high-performance brushed motors delivers an above-average flight time of between 10 and 12 minutes. • The battery gap has little space. • On a bright day, the LEDs cannot be seen. Equipped with 480p camera and 4.3 inch LCD remote control screen . 360°flips & rolls ,5.8GHz and 2.4GHz frequency ,FPV function . Mini quadcopter,latest 6-axis flight control system make it fly more stable. Just like the H107D and the H107C, the Hubsan X4 H107D+ went through a small renovation in recent times. This has resulted in an amazing FPV version of the X4 drone manufactured by this popular brand. 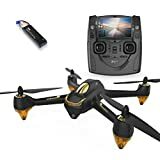 Basically, the company took the H107C+ and H107L and included the FPV feature to produce one of Hubsans most outstanding miniature FPV drones currently available. Among the most fascinating features of this drone is the smoother video transmission it delivers through its 5.8GHz transmitter. The integrated 4.3-inch LCD screen on this transmitter is also quite impressive. 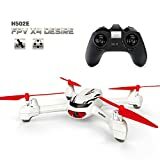 For persons looking for an incredible FPV drone-flying experience from Hubsan, this model should definitely be considered. It combines all the wonderful, well-loved features of the H107C+ and H107L and created the most ultimate edition of the X4 drone so far. Not too long ago, the H107C was the star of the Hubsan drone show. However, the H107C+, its newest upgrade, has made quite a few obvious enhancements on the drone that are worth checking out. The H107C has been renowned for being a remarkably beginner-friendly and stable drone. Considered a miniature model, this drone measures 4 inches in width, 4 inches in length and 1 inch in height. One of the more noticeable things about this Hubsan’s upgrade is its minor change in design and color. It is also equipped with a 720P camera, which is an upgrade from the more outdated 42P resolution. 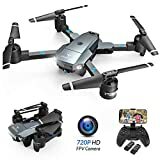 It sell for about $65, wich is around double what other drones costs in its category. Two of the most noticeable features of the H107C+ are the integrated headless mode and the altitude hold mode. The former is a great feature for beginners and the latter enables the drone to perform the cool feat of hovering in place while it is in the air. It has a 6-axis gyroscope that enables a more stable and smoother flight. In addition, its 3.7V 520mAh battery delivers roughly 7 minutes of flight time. Just like the H111 Q4, the Hubsan X4 H107C+ can cover a distance up to 100 meters. In addition, it only requires a low 40-minute charge time. The package of the latest H107C edition includes the Hubsan X4 drone, a USB charging cable, a transmitter, spare blades and two 520mAh LiPo batteries (for additional flight time). The H109S X4 Pro is truly exceptional and it is available in both a standard and high edition. The 3-axis gimbal X4 Pro H109S has a more professional transmitter and is sold for roughly $560. The more inexpensive X4 Pro H109S High Edition sells for around $300. As highlighted below, the good-looking quadcopter has a number of desirable features. These include the 1-axis gimbal rotation, which allows you to vertically adjust the camera. Additionally, the H109S X4 Pro has an impressive an incredibly long flight time of 30 minutes. This drone also has a remarkably long 1000-meter range in transmission, which is made possible by its extensively powerful 11.1V 7000 mAh capacity battery. An additional 8 AA batteries, which must be purchased separately, are required to operate the transmitter. In the world of drone flying, Hubsan has worked hard for the reputation they have gained. 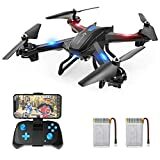 This is largely because of their decision to create some of the most easy to fly, beginner friendly and stable drones of any manufacturer currently in the game. These Chinese manufacturers are constantly undertaking new updates and more innovative renovations of their existing models. The attention to detail and the overall great pride they take in their work are quite evident. This has placed the company close to the top of the toy-class segment of drones. For the most part, the sizes and designs of these drones make them suitable for flying both indoors and outdoors. One of the characteristics of the manufacturer that is greatly admired by beginners and more advanced users alike is their meticulousness in appealing to the different levels of hobbyists. From their lower end drones to some of their most elite high end quads, there is a drone with the Hubsan brand for just about everybody out there. Hubsan is led and manned by passionate toy makers, who make sure that these machines are constructed with a bent on entertaining both you and your offspring. There is a lot of room for Hubsan to develop their operations and enter into the same market place as well-known manufacturers like of DJI. However, this is seemingly not what their mission appears to be at this time but the company is swiftly setting the tone to place themselves among the top drone manufacturers in the world. This is definitely a brand that should be watched closely. The manufacturers of Hubsan have a basic play book by which they operate: build an airframe and then build several versions of drone on each of the frames. A simple craft will provide little more than the capacity to fly; however, the same base frame could be used for FPV video streams and autonomous flight. The naming convention that is in place includes the Q4, X4 and more linked to each drone name. The most common X4 model is a quadcopter, which is basically a 4-propeller craft. Nano machines fall under the category of the Q4 model. If you come across a drone with a six in its name, expect to see a hexacopter, which is a drone with six propellers. When buying a Hubsan drone, the one you ultimately decide on will depend on a number of factors. These include your budget, skill level, stability of the flight, quality of the camera and overall purpose of the drone. The prices of the drones manufactured by Hubsan have a range of prices. They range from approximately $50 and goes up to upwards of $500. For this comparison, we will look specifically on the similarities and differences between the Hubsan H501S, which starts at a cost of roughly $200 and the similarly- priced MJX Bugs 2W. The Hubsan H501S is basically a low-cost GPS device that features a live first-person view from its 1080p camera. It is equipped with powerful brushless motors and also has quite a few other solid features. In this drone category, the closest brushless one that can compare to the Hubsan H501S is arguably the Bugs 2W. It is virtually the same size but is faster and lighter. In addition, the Bugs 2W relies on 5G Wi-Fi and does not use the analog video transmission system that is used by the Hubsan H501S. Even though the Bugs 2W uses Wi-Fi, it still pretty much has the same, or at least comparable, range to the Hubsan prior to the video feed starting to become choppy. There is no denying that the video quality of Hubsan H501S edges out that of the MJX Bugs. The Hubsan has better color, more superior image quality and it does not prop in the field of view. In addition, the Hubsan has a faster connecting and more effective GPS and it has a particularly longer flight tim based on testing done by a number of users. Overall, the Hubsan H501S is the better model; however, if you do not necessarily require a GPS drone, the MJX Bugs 2W could work for you.